The name Licor 43 is derived from the 43 ingredients from which it was originally made, principally fruits, herbs and spices from the Mediterranean basin. Legend has it that the origin of the LICOR 43 formula goes back to 209 B.C. when the Roman legions conquered the Carthaginian city of Quart Hadas, where rich, ancient liqueurs were produced. Today, LICOR 43 is present in 60 different markets worldwide and is the most well recognized International Spanish liqueur in the world. LICOR 43 is made in Spain’s port city of Cartagena from all natural ingredients including fine cane sugar and carefully selected fruits and herbs from the Mediterranean basin. Citrus essence combined with a delicate touch of vanilla give LICOR 43 it’s warm and charming aromatic character and flavor and make it so attractively unique. Perfect for sports and neighborhood bars with specific emphasis in iHub Markets as well as independent and select off premise chain accounts. 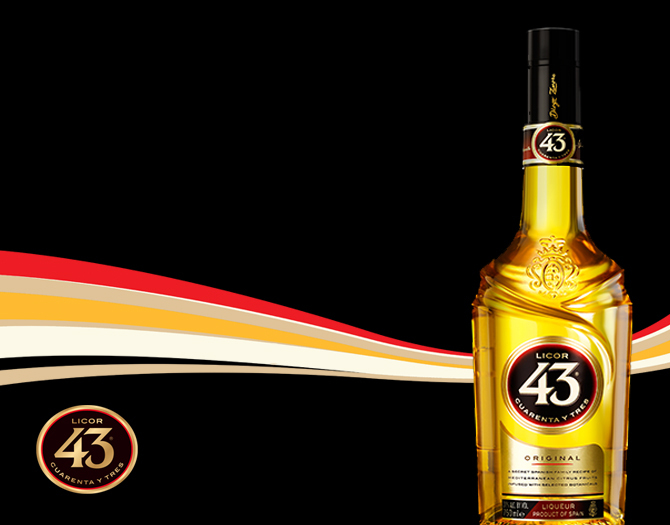 LICOR 43 resonates extremely well with all Hispanic demographics, where it’s also known as Quarenta y Tres.